Spiramycin is a bacteriostatic antibiotic, belonging to the group of macrolides. Spiramycin interferes with the bacterial protein synthesis, which leads to an inhibition of the bacterial protein synthesis and thus stops bacterial growth. Spiramycin is active against Gram positive bacteria (Streptococcus spp. ), Mycoplasma spp. and some gram negative bacteria like Pasteurella multocida). 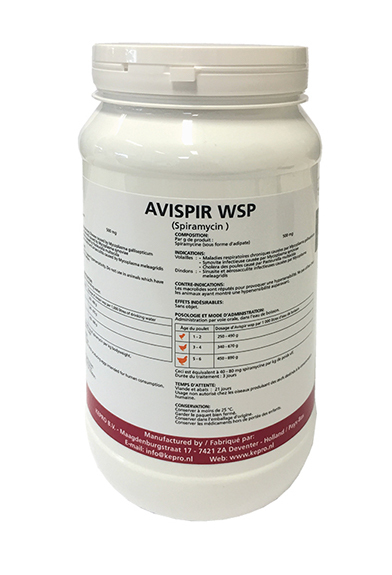 After oral administration, Spiramycin is absorbed quickly and is well distributed into the lungs, spleen, kidneys, liver and bones. Macrolides are known to cause hypersensitivity. Do not use in animals which have shown hypersensitivity before. Duration of treatment: 3 days. This is equivalent to 40 – 80 mg spiramycin per kg bodyweight. Not authorised for use in birds producing eggs intended for human consumption. Keep the package tightly closed. PET-Pharma jars of 1,000 g with PE closure (12 jars per box).